Last year, Professor Iain McLean retired from his full-time position as Professor of Politics and Official Fellow of Nuffield College. Earlier this year, Iain’s former colleagues, students, friends and family gathered at a conference celebrating his career. These blog posts are selections from these presentations – forming a digital Festschrift. 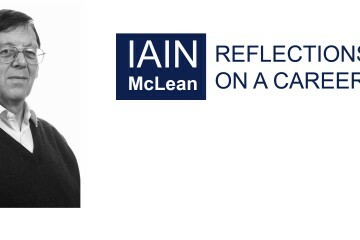 Up to the present, Iain’s career has encompassed a wide variety of sub-disciplines in political science, including voting theory, rational choice, political history and public policy, and has included diverse countries, including the United States, the United Kingdom and France. More broadly, his interests include choral and instrumental music (including conducting) and driving steam trains on the Welshpool & Llanfair Light Railway. Themes in the series include Theorists and Theory; British Policy and Politics; and Educational Environments. These posts offer a selection of snapshots from Iain’s career, reflecting the diversity of his interests, the character of the institutions where he has worked and the exceptional quality of his contributions to the discipline and many of its sub-disciplines.